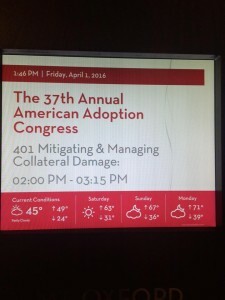 Arrived home from American Adoption Congress late yesterday. Left Denver hotel at 3:00 am local time (yawn) and arrived in CT at 4:00 PM. Long day of travel but it gave me a good amount of time to ponder the conference and my various take aways. I am going to write about each of these this week. Below is a high level list outlining just a few of them. Joyce Maguire Pavao ended her keynote on Wednesday with references to the infighting that is happening now within the ranks of the American Adoption Congress. I admit I cringed when she did. It felt like opening a can of worms and I questioned if the timing was correct. I later spoke to Joyce about this. She had stated that all of us in adoption come from a place of pain and trauma (true) and that impacts our ability to volunteer with organizations such as AAC. I agree and have said same myself years ago when Origins USA went through similar challenges. More about this conversation with Joyce in the days to come. There was a first mom in attendance that was heard repeatedly stating how “proud” she was of her decision to give her child to adoption. Many of us in the sessions with her cringed deeply every time she said this. We could not relate. Moreover, we found ourselves wondering how her child (she is not in reunion and is in a closed adoption) might feel to know their mother is so “proud” she gave them away. This person generated lots of discussion and debate amongst other attendees. I have never, not for one day, been proud that I abandoned my child to strangers. The session I faciliated along with my friends, Kathy, Susie and Rich was well attended. Based on feedback after the session I am under the impression it was well received. This pleases me. If only 1 of the 30 or so people in attendance think differently, we have accomplished our goal. The first mother voice was present and heard. That, in a sea of adoptee or adoptive parent focused sessions, was my ultimate objective. Let us not forget before an adopted child is stripped of their family and their OBC, a mother is stripped of a piece of her soul. Do better by expectant mothers and you do better for the children they give birth to. I spoke briefly with Amanda and Kat during a hospitality session. I mentioned to them a fact I have shared on my blog many times. That is, my ovewhelming desire to make myself better, smarter, prettier, more successful, more educated. I am never “good enough”. It is as if there is a wind up toy inside me that will not stop moving forward. I find this tiring and want to stop but do not know how. For years, I have suspected this was rooted in a desire to make myself presentable to my daughter should she ever want to meet me. I need to be “meetable”. I need to prove that I made something good out of our separation. It has been 30 years of this nonsense. It has been 10 years since I found her and she told me to go away and never contact her again. My daughter may never want to meet me. When will I get off this sick ride? Amanda said something to me that threw me back a bit. I am paraphrasing but essentially she said “If you do not accept yourself, why should your daughter?”. Ooph. Point taken. I discussed this same topic in my session the following day. Kat spoke up and shared the concept of post traumatic growth with me. I found myself intrigued. Clearly I have some reading to do. On the flight home my husband stated that I was good enough, more than good enough. While I appreciated his sentiment, that is not really the point. To be told you are good enough is not the same as believing you are. This entry was posted in About Me, Adoption Activism and tagged Adoption Reform. Bookmark the permalink. I am going to read all your observations Suz, I can’t wait! I would have been horrified if my n-mother had told me she was proud of herself for giving me up for adoption. And if you know anything about my story, you know that that is not how my first mother felt at all. Actually, I fear that many of the younger first mothers have been so brainwashed by the “brave, selfish and heroic” meme that they will be in for quite a rude awakening when they discover that their relinquished child doesn’t think giving them away is anything to be proud of, and, in fact, are quite hurt, even devastated, by it. I look forward to reading your other impressions about your time at the conference. Thank you for this post, Suz. I look forward to more. Joyce was brave to address the problems with AAC and I hope the organization takes note. Correct that it happens in all organizations, adoption-related or not. Equally appalled as Robin that any mother feels “proud” to haven given up a child. Not that I think feeling shame is great, but c’mon! I was touched by your feelings of being “meetable” by your daughter once you had a reunion. After relinquishing my son, I think I was still trying to make my parents think I was worthy, or “good again,” with no thoughts about what my son would think of me. I imagined that he would be a doctor or lawyer, but never considered that he would look down on me, although I was afraid he would be angry or hate me. As it turned out I achieved way more than he did, or expected of me. It was hard for him to understand how I did so well and he didn’t, because of the family he was brought up in. So there was resentment. So sorry to have missed the conference. Looking forward to reading more. Thank you for going and representing our stories. I look forward to all your reports. I wonder if the not good enough comes from the fact that we were told we were not good enough to keep and raise our sons and daughters. Something that in many cases was not based on the reality of our situations other than we were not married and we got pregnant. I really wish I’d been able to attend your session and meet you. I already have a deep respect for you, Suz. THank you for your kind words Lori. I am sad we missed each other as well. I always appreciate putting faces and voices to my online friends. Maybe next time!